- Panel 5 ref 2 - Blonde?! Leading questions? Questions that lead to what, the secret to my banana bread?! Forget it, Lisa! I will never make a comic that reveals my secret is adding an extra banana and not including nuts! I like chibi Nanase in this comic. I don't think I've done a great job recently with chibi versions of the characters, but I like the result here. This comic took me longer than it should have, mostly because I thought I knew what I was going to do visually and found it didn't really work (basically every panel except the first and last would have been similar to panel three), and then I kept changing the wording because I didn't think I was being entirely clear. 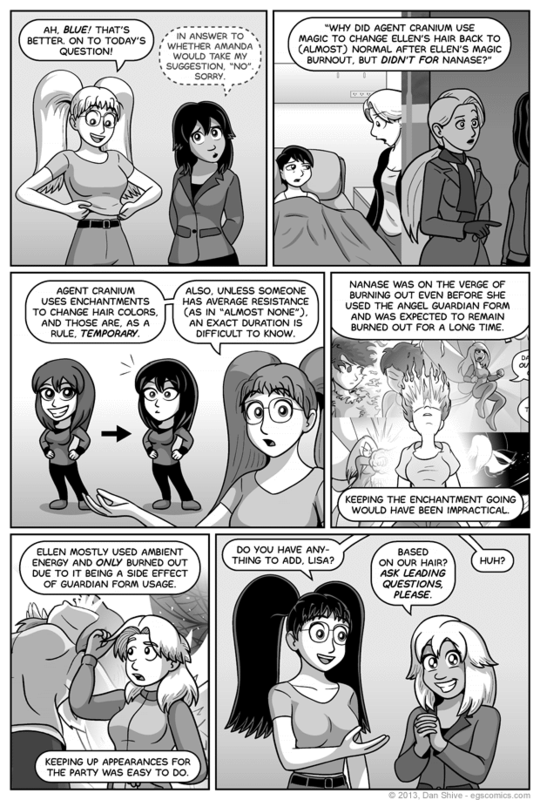 The only thing I miss about the concept of Amanda being visible in each panel of this comic is that the hair color change would have been more gradual that way. Ah well. Depending on what questions I wind up answering, there'll be more opportunities for gradual changing of things.